The Ultimate Music Wine & Food Experience Sweepstakes is open only to legal U.S. residents who are 21 years of age or older. The Ultimate Music Wine & Food Experience Sweepstakes ends at 11:59:59 p.m. (EST) on December 31. 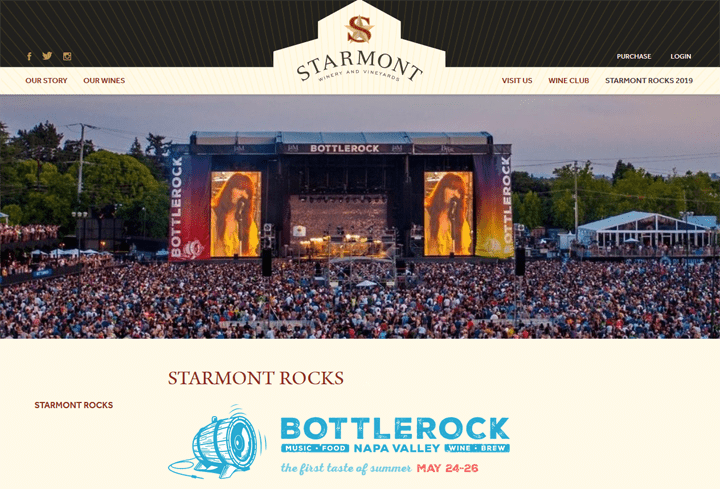 To enter online visit starmontwinery.com to complete the entry form. ONE (1) GRAND PRIZE: A trip to Napa Valley for an ULTIMATE MUSIC, WINE & FOOD EXPERIENCE. The WINNER and ONE (1) Guest will receive a 3-Day Pass to BOTTLEROCK. Prize includes Airfare and Hotel Accommodations (Approximate Retail Value of prize is $2,500).